Hannah with students on a program. Click to enlarge. 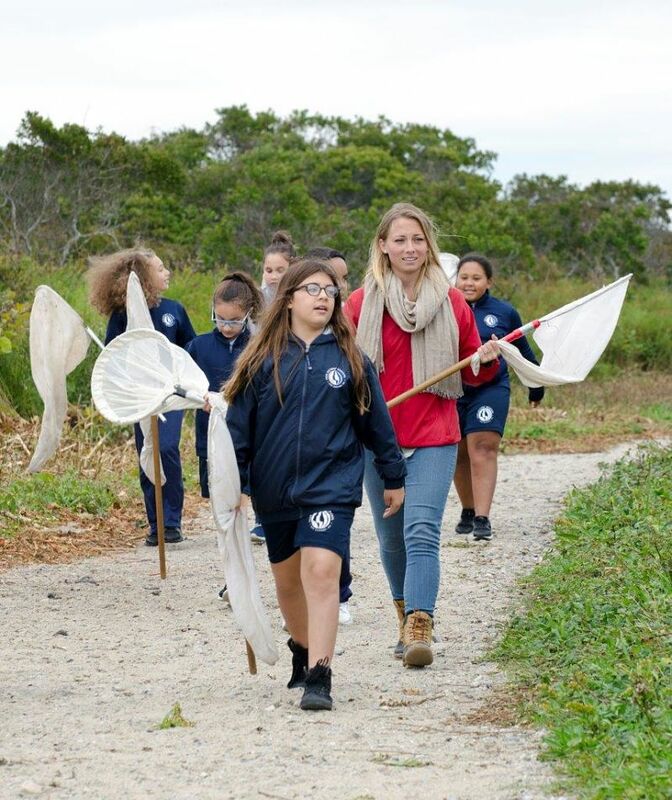 The Lloyd Center is pleased to be the beneficiary of a $2,500 Intern Scholarship that The Garden Club of Buzzards Bay awarded to Hannah Erickson, Education/Outreach Intern. Hannah’s internship responsibilities include assisting the education and outreach staff in teaching the Lloyd Center’s hands-on science programs, as well as exhibit maintenance. Over the years, The Garden Club has been a big supporter of the Lloyd Center’s Butterfly Garden and it’s been wonderful to see it grow and flourish. The Lloyd Center staff is thrilled that this year, the Garden Club was also able to support the Center with an Intern Scholarship. “My experience at the Lloyd Center began in June, 2017. When I first sat down to be interviewed, I explained that I wanted to “get my foot in the door” for environmental work. The Lloyd Center staff was eager to help out and hired me to teach the Young Naturalist program! I began as a teacher, taking students out to the estuary, forest, saltmarsh and Visitor Center. I personally sought out to gain public speaking skills and teaching methods, and to learn general information about the places we were taking the students to. With an abundance of resources, I learned about the Lloyd Center property and have undoubtedly expanded my knowledge of the environment. When the summer internship was ending, I was asked to continue my internship. (This was possible because of the wonderful scholarship that I was awarded from the Garden Club.) I was thrilled to be able to stay! Founded in 1930, The Garden Club of Buzzards Bay’s mission is to stimulate the knowledge and love of gardening through education in development of gardens, their design, management and culture and to restore, improve and protect the environment through education, programs and activities in the field of conservation, horticulture and civic improvement. The Garden Club of Buzzards Bay is a member of The Garden Club of America.